Crumb specialise in handmade cake gifts delivered all delivered to your door, with afternoon tea, cake and cocktails. Say thank you, happy birthday, congratulations…with the gift of cake. They bring together the finest quality handmade cakes, drinks & trimmings for all occasions, including birthdays, ‘date nights’, baby showers, hen parties, thank you gifts and for the times when you need cakes at work. A crumb. box can also create an event, such an elegant afternoon tea party, or a coffee morning that brings coffee shop culture into your own home. The boxes are not only elegant and delicious but also convenient: all the boxes fit through a standard letterbox. Simply order online for yourself or for a loved one – including a personalised message if you wish. You can even download extra printable event trimmings, such as bunting, invitations and thank-you cards. 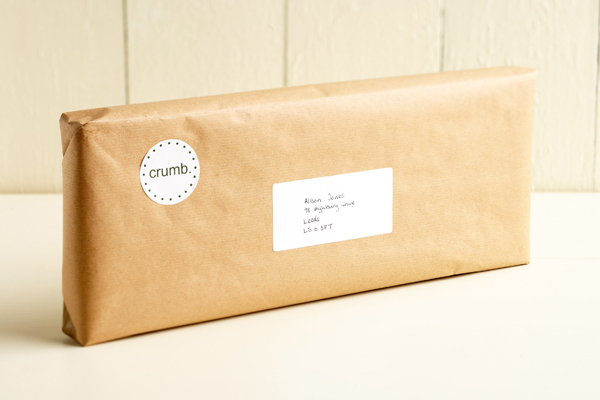 Crumb was founded in 2011, by Vicky and Helen, two Leeds based new mothers. They found themselves in a whole new world, and quickly began discussing a convenient way for new mothers, who are both time poor and prone to cake eating, to enjoy a proper afternoon tea party. Very quickly, discussing turned into researching and product designing, and crumb. was born. Importantly, Helen knows good cake. From 2006-2011 Helen ran a successful cup cake business, supplying the finest delicatessens and coffee shops in and around Leeds with a unique range of cup cakes. The longest running customer of the company was Salvo’s Salumeria in Headingley, voted the best Italian deli in the north of England by the F Word in November 2009. The brilliant creative team at crumb. are working on a range of other boxes. At the research and development stage at the moment are: The After Dinner Party Box, The Birthday Tea Party Box, and The Coffee Morning Box. As with The Afternoon Tea Party Box, these boxes will be filled with the finest, most elegant and delicious fare.